Totally flummoxed as to what to call this thing. 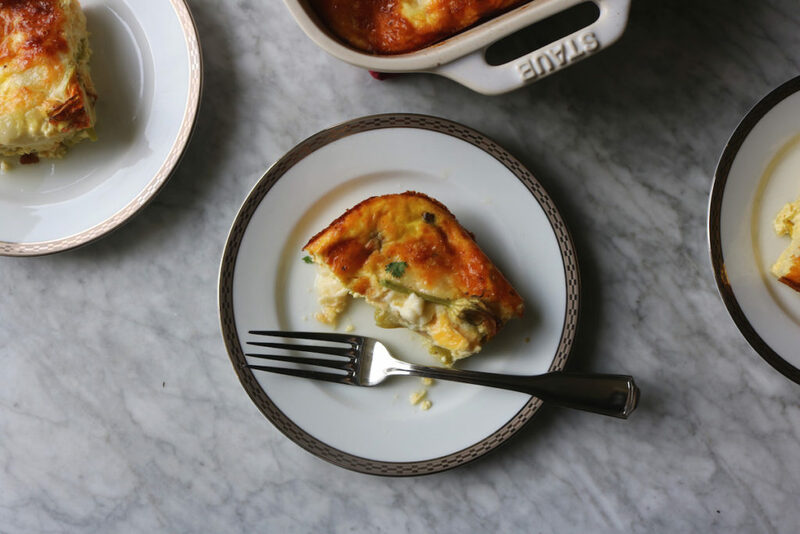 It’s not a frittata because it’s not cooked like a frittata…but it seems to be a very close cousin to one. I don’t want to use the words casserole or bake because for some reason that feels a little like I’m cooking from the back of a carton of egg substitute. 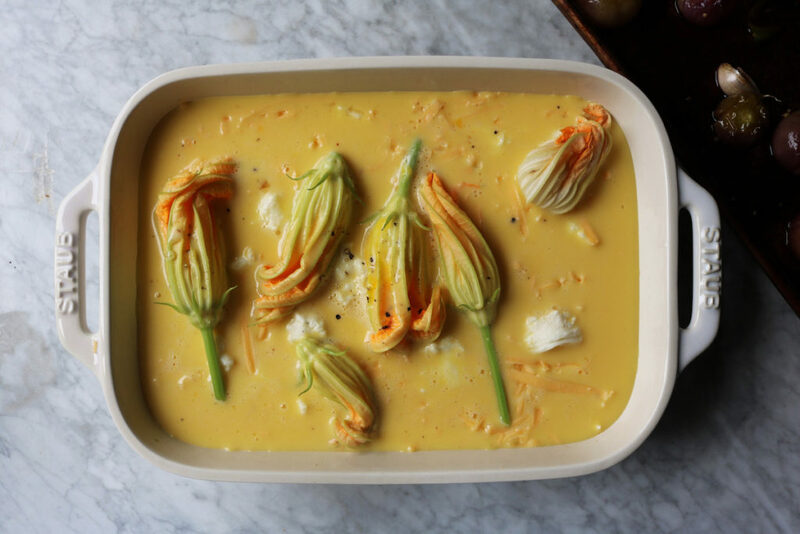 And yes, I know what you’re thinking…we’re using squash blossom again. Eye roll. Perhaps by now I’ve convinced you to plant squash next summer? Then you can complain about how abundant they are (who does that, you ask? 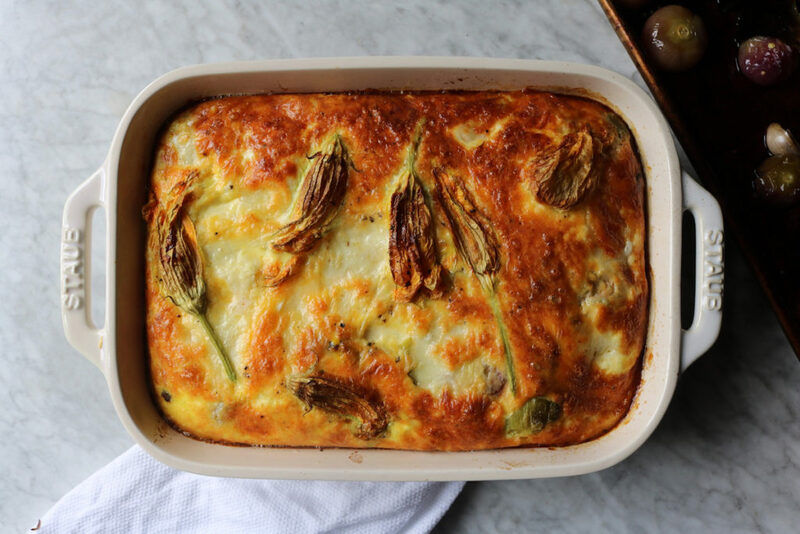 me…that would be me) and make squash blossom pizza, squash blossom brunch eggs and zucchini muffins that are so pious your friends won’t even know who you are anymore. If you really want to twin with me in summer ’18 I’m going to also need you to get some chickens and plant some Anaheim chiles + purple tomatillos. As long as we’re going to do this, let’s do it. This comes together so quickly you won’t know what hit you. It’s perfect for entertaining (see below) and it’s also equally perfect for when you have a week to yourself and no one else to feed. Substantial. Healthy. Easy. I’m kidding. This isn’t how I really live. OK, I can tell you’re on the edge of your seat with brunch eggs. Flexible. This is one of my favorite recipes because you can completely customize it. 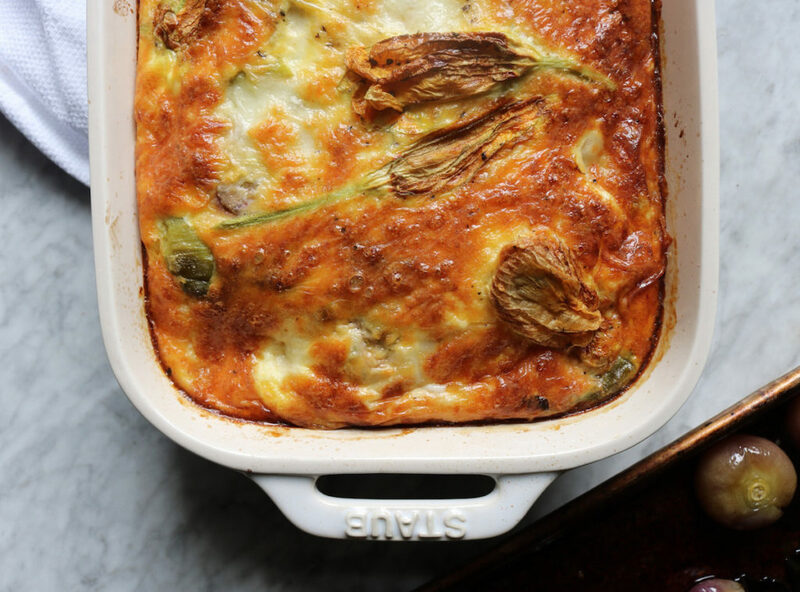 You could add roasted red peppers…tomatoes…herbs…other types of cheeses…skip the squash blossoms…add in asparagus. I went for Mexican vibes…but it seems like it could swing Italian on a dime. Make Ahead. I know. It’s my love language. Are people still saying that? But you could make + bake this, wrap tightly in foil and shove in the fridge and reheat in the oven at the same temp (still covered in foil) until heated through. Entertaining. Because of the above ‘make ahead’ note, it’s perfect for when you have people over. Make the entire thing the night before and then in the morning your hands are free to gesture dramatically and hold glasses of champagne. Recipe. This recipe is more of a suggestion, than a strict recipe. Much like Beijing traffic laws…follow some of it and freestyle the rest. As long as you stick to the measurements for eggs, seasonings + milk you can play around with the other ingredients. Which is why I give a range for tomatillos and squash blossoms…how much of each you want up in there is up to you. I went on the lighter side…because I wanted subtle flavor…however, you could feel frisky and go all in…as you do. 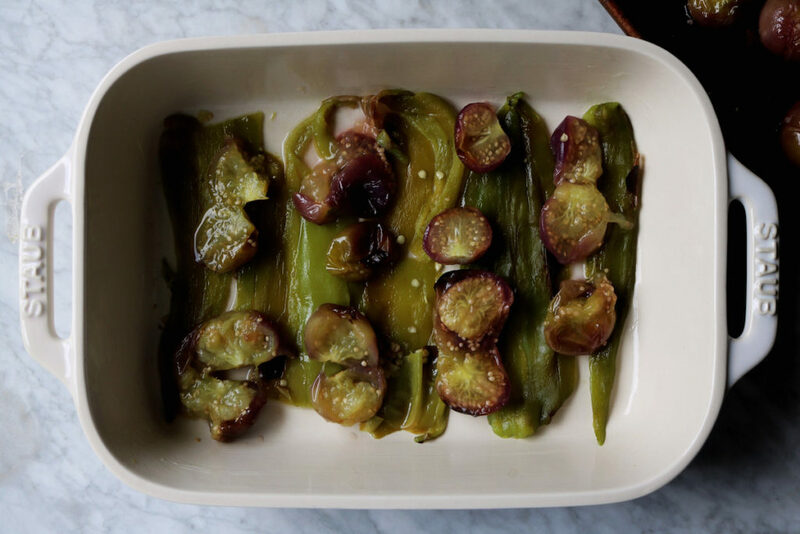 Place the Anaheim chiles + tomatillos on a baking sheet. Toss with olive oil and place under the broiler for about 4-5 minutes or until charred. Turn chiles + tomatillos over and char for 2-3 minutes more. Once the chiles are cool, pull off the charred skins, stems, remove the seeds and cut into lengthwise strips. Cut the tomatillos in half. In a large bowl, whisk together the eggs, whole milk, 1% milk, sea salt, pepper and smoked paprika. Preheat your oven to 375 degrees F, butter a 9X13 casserole dish with 1 tablespoon of butter. Lay the chile strips across the bottom of the casserole dish. Sprinkle with the tomatillos, the cheddar, mozzarella, squash blossoms and then the pour the egg mixture over the top. Bake in the center of the oven for 50 minutes. Let sit for 10 minutes before cutting. Sprinkle with cilantro if you’re feeling it. Goes really well with sourdough. Maybe a tortilla? And some salsa. Just a thought. Thank you for making these squash blossom and tomatillo brunch eggs… Tag me on social @displacedhousewife #displacedhousewife so I can see them!!! We have this whole monsoonal flow thing happening right now and the lighting was so moody and perfect when I went to photograph these brunch eggs…I don’t know if you would have gotten the recipe if the lighting wouldn’t have been so fantastic. But here we are. And my hair is channeling Diana Ross. So many wonderful things about this article. But the headline wins. Ok. That’s all. Keep up with the good fight. You’re doing it and making it happen. Much love + light. Squash blossoms are a favorite! 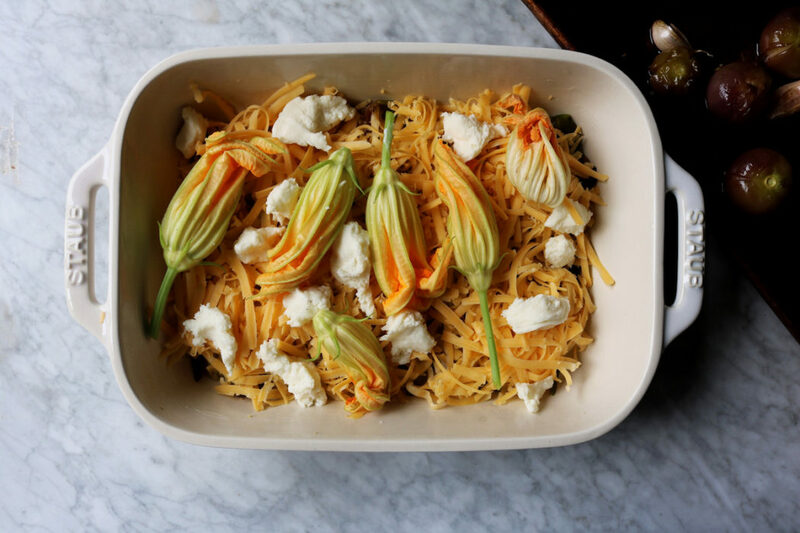 In Greece, we have a recipe with rice-stuffed squash blossoms. I am going to have to make this dish for my next brunch! Damn these look delicious! Once we become IRL Bffs I’m going to fly in and visit you in Cali and we can make all of the brunch eggs. I don’t care what you call this one Rebecca, I call it delicious! Love, love, love the squash blossoms, the tomatillos and the chiles. Such a great combination. Breakfast/brunch is my favorite meal of the day, and this will look so impressive for guests who come to visit us at the beach! I can’t wait to try it! It’s my favorite too…and I wanna come to the beach house!! I need your brunch eggs! And all your excess blossoms! Looks fantastic! You do!!! Thank you Christine!!!! I would love to twin with you in summer ’18! But not a full twin, I’m not sure I can do the chickens. Is that ok? Loved this tasty brunch eggs… the squash blossoms were AMAZING! I’m definitely going to plant squash next summer, just so I can get the blossoms. Thank you for sharing and hosting me this weekend!